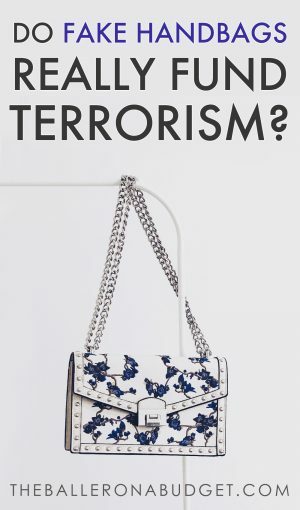 The counterfeit industry’s connection to human trafficking and terrorism gives the term “dress to kill” a whole new darker, menacing meaning. It’s been almost 2 years since my very first review on a designer dupe, and since then I’ve been very lucky to grow a loyal readership of thousands from my continued reviews. I want to encourage you, my Baller family, to become smart shoppers and spend your dollars wisely, especially on fashion items that go out of trend just as quickly as they come in. After seeing many of my favorite bloggers talk about them, I realized that “dupes,” or items that are strikingly similar to a higher-priced item, have become well-received within the fashion community during recent years. I joined the hype, sharing a variety of dupes of popular designer handbags and shoes to help everyone save money while looking fashion-forward. But presently, I am growing increasingly concerned that these designer dupes are becoming incorrectly associated with counterfeits. It’s true that the very definition of a “dupe” is an affordable item inspired by something more expensive; however, there is a huge difference between a counterfeit Chanel bag and a similar quilted purse with an interwoven chain and leather strap. See my previous post: The Difference Between Legal Dupes and Fake Designer Goods. Another concern of mine, which I’ll explore further down in this post, is also the possibility that these strikingly similar dupes could be thinly-veiled precursors to counterfeits. It’s not completely impossible that they could be sold to buyers just before applying the final touches of logos and labels. But that’s for a later discussion just a few scrolls down. I’m not trying to pass judgment on people who buy fakes – your money and financial situation is your story to tell. But I feel a responsibility to shed light on the sinister business that is the counterfeit industry and how its proceeds fund organized crime, terrorism, and human trafficking. Purchasing a fake Gucci belt might seem like both a guiltless and victimless crime, and you might even be relieved to learn that according to the official Justice.gov website purchasing counterfeit items for personal use actually isn’t illegal in the United States. However, it’s more than likely that someone is suffering at the expense of the money you save. To address some gossip I found about my blog on this Reddit thread: I’m guilty of having bought fakes in the past. I’m sure more than a few can relate when I say that during one point in my life I was compelled to buy them in order to feel accepted by my peers. However, due to a keen eye for quality and owning both genuine luxury goods and fakes, I was never able to sport these knockoffs in public and feel authentic. I felt like a fraud. That’s why dupes seemed like a viable alternative that my conscience (and ego) could live with. Why are Fakes So Prevalent Today? There are a variety of reasons why counterfeit items play such a big part in our economy. In recent years, countries such as China, Russia, and even India began producing higher wage-earners thanks to the advancement of higher education as well as industrialization. With higher wages, people began purchasing more luxury items across the globe, making them more common. Additionally, with celebrities sharing their million-dollar lifestyles on platforms like Instagram, our social media feeds are inundated with rap stars wearing Louis Vuitton tracksuits, reality TV stars taking selfies in their closets full of 50+ Hermés Birkin bags, and influencers sharing their travels with a new designer handbag in every photo. Now more than ever, the 1% lifestyle is completely normalized, although the remaining 99% may not have the privilege of experiencing it. As a result, many people who can’t afford a luxury lifestyle resort to purchasing counterfeits in order to have a slice of the pie. 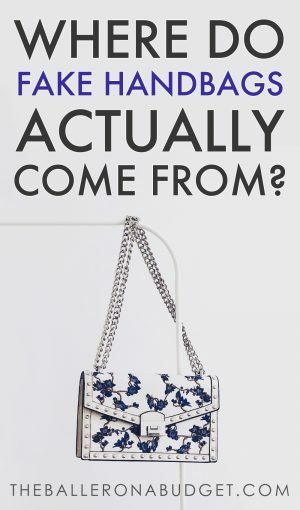 It also doesn’t help that wealthy people like Paris Hilton and many other celebrities have been spotted sporting fake handbags, which further validates the use of counterfeit items to maintain appearances. Needless to say, running a counterfeit business yields a high-return with extremely low-risk. And it’s even more lucrative now. Where peddlers used to host “purse parties” and sell fakes purchased from Santee Alley or Canal Street to suburban housewives, you can find now Facebook groups and Whatsapp chats where you can buy fakes from modern-day purse party women. The moderators of these groups share popular fakes in these groups of 1,000 – 10,000+ members and receive commissions from manufacturers for every item sold through specialized URL links. With online groups that large, it can be assumed that peddlers are able to generate as much as 5 to 6-figure profits annually. Along with the ease of online transactions, purchasing fakes has become lighter if not completely nonexistent on a buyer’s conscience thanks to the anonymity and privacy of these online sales. 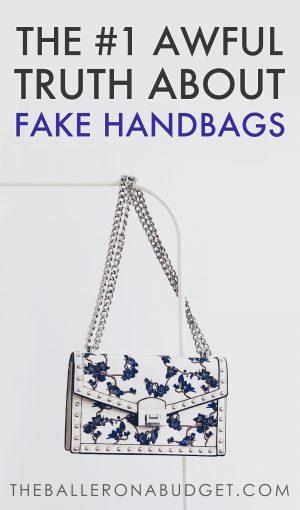 When you hear the word “fake,” you might associate it with a poor-quality item that doesn’t resemble the quality of a top-tier designer bag at all, much less look similar to it. However, the counterfeit industry has something for everyone’s taste as well as budget, and that gives its appeal. Spend $20 and you can get an obvious knockoff of the Gucci Double-G buckle belt made of polyurethane and plastic, or spend about $75 – $100 and get one made with Italian leather, packaged in a Gucci gift box and shopping bag, including a fake (but-oh-so-convincing) sales receipt that contains a serial number matching the one stamped onto the underside of the belt. The differences in quality are so impeccable that there’s even a grading system from A to AAAA, + or -, and extremely accurate counterfeits are called “replicas.” Then there’s the next step: a “super fake,” which luxury reselling website Lollipuff says are often cleverly sold as pre-owned genuine authentic items at a secondhand price. Some of these online counterfeit peddlers have a close relationship with their manufacturers, allowing customers to customize Louis Vuitton Neverfull replicas with their initials stamped onto the handles of the bag. You might even be able to pick between monogram or damier canvas, the color of the lining, and select a leather handle finish that would patina over time just like the real deal. The ability to customize fake goods online has reduced the desire for people to purchase the real thing in-person. Other than the boutique experience, if you could get all of this for much cheaper in the privacy of your own home, then why not? Let’s address the elephant in the room. What do these counterfeiters use the money for? How are their items produced at such low costs? The answers are not an easy pill to swallow: the sales from counterfeits are commonly used to support organized crime and terrorism and have been responsible for many well-known terrorist attacks. And if that isn’t bad enough already, the business utilizes human trafficking and child labor in order to keep prices low. Yes, that means somewhere in Guangzhou, China, where many fakes originate from, there was a child who was sold into forced labor and is probably facing inhumane living and working conditions in order for you to purchase a fake pair of Christian Louboutins for only $40. Counterfeit bargains are too hard to resist for buyers, easy to produce for manufacturers, and innocent or victimless to the public, which makes this business instantly profitable for organized crime. How? Alistair Gray, an intellectual property investigator, expressed in a TED talk that brothers Said and Cherif Kouachi (the terrorists responsible for the Charlie Hebdo attack) were monitored by the French security services in 2014, but were only observed purchasing fake sneakers in bulk. Their actions were considered low-level petty crime and nothing was done about it. The brothers walked into the Charlie Hebdo office, killed 12 people, and injured 11 more. According to Gray, the guns used in these attacks were obtained using the proceeds of the fake sneakers they were purchasing. Additionally, in 2004, 191 people died during the Paris attacks when the Madrid commuter train was bombed. What funded the attack? According to New York police commissioner Ray Kelly, pirated music CDs sold in the US were the cause. Domestic terrorism in the US is also a byproduct of counterfeit sales. Canal Street counterfeit sales are overseen by Chinese gangs such as the Fukienese, and when the police attempt raid operations on these gangs, it often gets violent. In “Deluxe,” Andrew Oberfeldt states that back in the 90’s the Born to Kill gang would often use pregnant women to hide their counterfeit wares and even sit babies atop cases of M-80 explosives to prevent seizure. Gangs would come after cops, slashing their tires, throwing knives and even explosives. “Snitches” and “rats” would either get beaten or even murdered. U.S. Attorney David N. Kelley said that in one of his cases, a man suspected of working with the police was beaten with a pipe until his bones snapped. Although you might think child labor has become a thing of the past, it’s still prevalent in the counterfeit business. In impoverished parts of China, families often sell their children in the hopes that relocating them to the city will give them a better quality of life. Unfortunately, children as young as six wind up working in unregulated counterfeit factories and are subjected to cruelty and exploited labor (United Nations Office on Drugs and Crime). And their situation doesn’t improve when these factories are raided: once they’re shut down, children are left homeless with no job and often resort to prostitution to make ends meet. The worst story I heard was the one told by Thomas in her investigative non-fiction “Deluxe”: In Thailand, an investigator went to an assembly plant and saw several children sitting on the floor with broken legs, assembling counterfeit handbags. The owners broke each child’s legs and tied their lower leg to their thighs so that their bones would never heal. What was the cause for this inhumane cruelty? The children simply wanted to go outside and play. Are Fast Fashion or Designer Dupes Affiliated With the Counterfeit Industry? With many brands such as Forever 21, H&M and other fast-fashion retailers that carry dupes of your favorite designer items, who’s to say that the same warehouses they buy from don’t also produce fakes under the table? The brutal truth of fast fashion industry is that the brands we buy from outsource their manufacturing to warehouses in places like Guangzhou, China, where the same warehouse could very well be producing counterfeits as a side business. Counterfeit goods are often hidden in shipping containers underneath legitimately manufactured items to pass through customs. Sometimes, many goods are transported without brand labels or logos, and after they land in the country of distribution, illegal immigrants in their sister warehouse will slap on logos, where the goods are finally given to the distributors who peddle them to unknowing people like you and me. As for designer dupes: my stomach sank when I ordered a Bulgari Serpenti dupe from Aliexpress, only to open my package and discover the bag had a poorly-attached metal “BULGARI” logo on the back, and the metal eyelets were also adorned with the brand’s name. When I contacted the seller, they agreed to send me a replacement without logos, but said they thought it was odd I complained about it since all of their buyers receive bags with logos and nobody ever complained about it. The guilt upon this discovery was unfathomable for me: I actively promoted logo-less dupes with the idea that we weren’t hurting anybody, but many of these dupes could very well be counterfeits without logos. And although we’d never know for sure, I am personally making the conscious choice to steer clear from blindly promoting designer dupes without complete assurance that these goods are not exploiting children or funding terrorism. Your intention, like mine, may come from a genuinely good place when purchasing a dupe from a mom-and-pop fast fashion store at the mall in order to spend wisely. But I urge you, with the knowledge you’ve discovered from this post, to think twice about where you purchase from. I’ve made the choice to reduce senseless spending at fast fashion corporations and restrict trendy item purchases through reselling websites like Poshmark or by thrifting at my local secondhand store. In regards to quality items, I’ve resolved to purchase new pieces from brands that offer sustainable, eco-friendly and fair-trade clothing. It may not be as cheap as a $5 pair of leggings at Forever 21, but companies like Pact offer 2 pairs of leggings for $40 that are not only reasonably priced but also offer both quality and a clean conscience. And even if you can’t afford designer stuff, there are still many beautiful high-quality handbags and accessories from up-and-coming brands that cost much less, like Parisa Wang and Cult Gaia. What about designer dupes? Just like fast fashion, that’s a gray area I’ll leave you to explore with your own conscience, as it’s hard to determine the integrity of their production. I’m not here to judge your financial situation, and I understand that it takes time to change your spending habits and transform your budget. However, if you’re buying luxury handbags with money that you don’t have or supporting the counterfeit industry by purchasing a fake, I do want to challenge your ethical beliefs as well as your ability to cultivate your self-esteem without the use of luxury items as a crutch. You don’t have to subscribe to the outdated belief that owning expensive bags and shoes is the only way to show that you’re doing well in life. If you want to live authentically, the first step is to present yourself honestly. You’re doing just fine without Coco Chanel – you don’t need a fake handbag in order to remind yourself of that. Thanks so much to my friend Morgan Schadegg whose help with finding sources gave me the confidence to hit “publish” today. Her eco-conscious fashion and luxury thrifting skills are admirable and I highly recommend following her on Instagram to see how she gets all of her luxe deals. I also highly recommend reading the New York Times bestseller Deluxe: How Luxury Lost Its Luster by Dana Thomas. Thomas is a fashion and culture journalist whose book highlights the democratization of luxury and how it has contributed to a decline in quality, overseas mass manufacturing, and the rise of the counterfeit industry. This was a great, eye opening article. I will admit that your “dupes”is what drew me to your IG account. I do own several real designer bags and belts, but when I go to China, I usually get requests from friends to pick out certain bags, etc. I’m thankful for most everything you share, and the work you put in in researching for your audience. I’m so grateful you found my blog and I’m honored that I inspired you with the world of dupes, but I hope you enjoy the fresh content I’ll be sharing! Thank you very much for this insightful, compelling post. No doubt it was difficult to write. You have done a great service to humanity by disseminating this information.